International Workers Day, or May Day, is a day of celebration, remembrance and solidarity. On the first of May, workers throughout the world demonstrate for better working conditions, socio-economic equality, universal healthcare and education, and the right to unionize and strike. But, to best understand why workers in America should celebrate May Day, we need to know its history. The 19th century witnessed some of the worst acts of barbarity in the workplace. Women, children and immigrants were used as a source of cheap and obedient labor, working conditions were outrageous, unions were small and brutally repressed, and workers spent 10, 12 or 14 hours a day making profit for the bosses. It was capitalism at its best. In 1884, the Federation of Organized Trades and Labor Unions (FOTLU) passed a resolution demanding the eight-hour workday, starting from and after May 1, 1886. 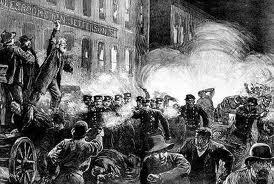 The resolution called for a general strike; by April 1886, over 250,000 Americans had heeded the call. The eight-hour movement was growing rapidly and radically, especially in Chicago. On May 3, 1886, following some successes, strikers at the McCormick Reaper Works Factory in Chicago faced police batons and bullets. Four workers were killed and many injured. Immediately afterwards, a local group of anarchists organized an anti-police brutality rally in Haymarket Square. On May 4, thousands came out for the evening rally without incident. As the last speaker took to the platform the rally had dwindled down to a couple hundred, and nearly 200 police officers moved in to disperse the crowd. In the shuffle, a bomb was thrown among the police, killing one and injuring dozens, resulting in police gunfire, which killed or injured an unknown number of workers. This event became known as the Haymarket Tragedy (or “Haymarket Riot”), and saw a sharp increase in police repression of anarchists, socialists and unionists. Eight prominent Chicago anarchists — August Spies, Albert Parsons, Adolph Fischer, George Engel, Samuel Fielden, Michael Schwab, Louis Lingg and Oscar Neebe — were arrested, tried and convicted of conspiracy in the Haymarket bombing by a rigged jury and biased judge, with little evidence and even though only one was actually at the rally (and he was a speaker on the platform). Parsons, Spies, Fischer and Engel were hanged on November 11, 1887; Louis Lingg committed suicide the day before his execution on November 10, 1887; Illinois Governor Altgeld pardoned Fielden, Schwab and Neebe on June 26, 1893. In 1889, the founding congress of the Second (Socialist) International met in Paris, France, on the one-hundredth anniversary of the French Revolution, and called for a worldwide demonstration for the eight-hour day. Unfortunately, May Day began to lose importance in the United States, its place of origin. In 1894, the U.S. government declared the first Monday in September as Labor Day, with the aim of pulling the labor movement away from the radical nature of May Day. The American Federation of Labor (successor to the FOTLU) was becoming one of the largest unions in America and, by 1905, had gone with the government in supporting Labor Day and disavowing May Day altogether. To add insult to injury, the American Bar Association declared May 1 a celebration of the principles and practices of capitalist law and order — Law Day. Then-President Dwight D. Eisenhower established Law Day by proclamation in 1958. That such a day of international workers’ solidarity can be turned into a celebration of capitalist “justice” is a disgrace to the women, men and children who struggle under exploitive conditions, and the Haymarket martyrs who lost their lives in the pursuit of justice in America. Today, International Workers’ Day is celebrated throughout the world and is recognized as the official workers’ holiday in almost every country, except the United States. Each year, millions of workers demonstrate, wave flags and carry banners, sing and dance, educate, organize and agitate for a better, peaceful tomorrow.